It has been four years since the creation of the Mars Curiosity Twitter account, and one thing hasn’t changed – the witty rover’s still got it. Behind the pop-culture-savvy, science-loving bot is a social media team brimming with ways to engage the public in NASA’s other-worldly exploration. 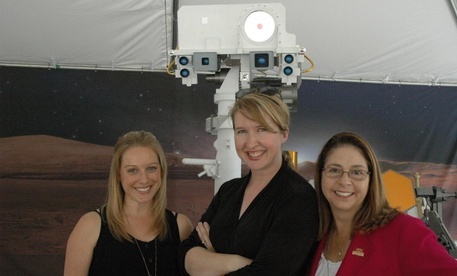 NASA’s Jet Propulsion Laboratorykeeps news and social media manager Veronica McGregor and social media specialists Courtney O’Connor and Stephanie L. Smith busy, running the social media accounts and public affairs for more than 20 flying missions. McGregor has been a NASA news and social media guru the longest, joining the JPL team in 2001 after covering NASA for CNN. O’Connor joined McGregor shortly after graduating as an early career hire in 2009 just as Curiosity was being built. She joined the team after working for Microsoft as a social media intern. Smith was the last to join the JPL social media team in 2010. Before working for NASA, Smith was the senior editor for the online division of Channel One News. She covered and translated many JPL stories for the news organization. The women refer to the team as JPL’s social media “hivemind.” Scientists send data collected from Curiosity to the team to simplify complicated terminology, add a little spice and condense the information into 140 characters or less. And when these social media savvy team members don’t quite understand the information they’re supposed to tweet, O’Connor said help is never too far away. The team said they try to accommodate everyone when it comes to catering tweets to followers. McGregor said they include “techy” and fun mentions in each tweet because some followers just want the funny headlines, while others want all the technical details. To keep tweets fresh, the team will throw in a song lyric with a Curiosity twist or refer to movies. She said tactics like these help keep the conversation going. When Curiosity was undergoing software maintenance, the team had to decide how to condense the science into an interactive, fun and brief tweet. The Hivemind decided on a quirky Matrix reference. “When curiosity was getting its brain transplant … we started thinking about ‘what are we going to tweet for that?’” McGregor said. “Half a second later, people were writing back saying ‘show me!'" But as pop culture tweets gain a lot of attention, none has surpassed the landing night tweet, lovingly referred to as the “touchdown tweet” by the Curiosity team. The touchdown tweet received nearly 72,000 retweets, the most the Twitter account has seen since creation. “That’s Bieber level,” Smith said. Along with her hefty retweets, Curiosity hauls in a lot of followers. Curiosity has nabbed the No. 1 spot as JPL’s biggest account from previous leader,@AsteroidWatch. Since her launch, Curiosity has accumulated more than a million followers. Because the tweeters behind the account are human, accidents occasionally happen. Typos and inaccurate information sometimes slip through the cracks, but the team said it doesn’t happen frequently. O’Connor said the team is thankful that Twitter is very forgiving. Blunders aside, Smith said it is important to connect with the public through social media communication. McGregor said more than 50 percent of Curiosity postings are replies rather than the team pushing out new information. With the social media boom, NASA not only increased its audience worldwide, but it also fostered a stronger relationship with the public. Curiosity’s Twitter team said fans should be on the lookout for results from recent science experiments on Mars. In the meantime, fans are encouraged to wish JPL a happy birthday as it celebrates its 76th anniversary Wednesday. Tanya Parker is a senior broadcast journalism and Spanish student at the E.W. Scripps School of Journalism at Ohio University. Originally from Perry, Ohio, Tanya is the producer of Athens’ local entertainment news program, “Straight Up!” Tanya has also reported, anchored and produced for “Athens Midday,” and served as the multimedia producer for the online environmental magazine, College Green Magazine, for one year. In addition to broadcast, Tanya worked as the Wit & Banter columnist at The Post, an independent, student-run newspaper at Ohio University.